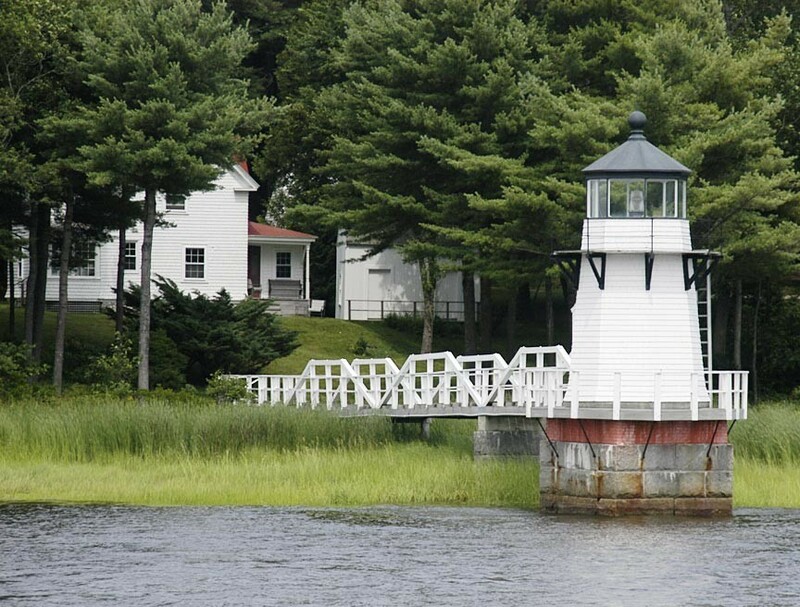 Take a Maine Maritime Museum Lighthouse Cruise! See Doubling Point Lighthouse – among others! There’s something inherently evocative – even romantic – about the sight of a lighthouse and the Maine is know as “The Lighthouse State” for good reason, with over 60 lighthouses along its coastline. One of the best ways to see them – and other coastline attractions – is from the water with a lighthouse cruise from the Maine Maritime Museum! The Maine Maritime Museum’s 20-acre campus on the banks of the Kennebec River in Bath, Maine, focuses its attention on Maine’s maritime heritage and culture – a culture so rich with things to learn, see, and do that admission to the museum is good for two days so you can have a chance to see the majority of it! The Maine Maritime Museum offers interactive exhibits and demonstrations but then goes above and beyond your average museum with “exhibits” like the a Victorian-era shipyard owner’s home; the country’s only surviving historic, wooden-boat shipyard; a full-size replica of the Wyoming – the largest wooden schooner ever built and, consequently, New England’s largest sculpture; and daily lighthouse cruises and trolley tours! Maine Maritime Museum’s regularly scheduled cruises along the Kennebec River and her connecting waterways provide a number of different cruises that focus on river nature, lighthouses in the area, and Bath Iron Works. Take the popular, two-hour, Six Lighthouse Cruise for an opportunity to see and photograph six of Maine’s most beautiful and unique lighthouses. Extend that cruise time by one hour for the Seven Lighthouse Cruise. This Maine Maritime Museum tour will take you by Bath Iron Works, through Hells Gates on the Sasanoa River, then along the historic Sheepscot River to the Kennebec for close-up views of seven of Maine’s picturesque lighthouses. Really love those lighthouses? Then the Maine Maritime Museum’s four-hour Lighthouse Lovers Cruise is for you with a chance to see ten (10!) of Maine’s gorgeous lighthouses from the water. Wow! The Shipyards & Lighthouses Cruise, will wow you with stunning views of Bath Iron Works, two lighthouses, and area wildlife. Only an hour long, this cruise is a perfect complement to the museum’s exclusive “The Bath Iron Works Story” Trolley Tour. Ever wonder about the construction of the world’s most advanced ships and how Bath Iron Works earned the “Bath Built is Best Built” reputation? “The Bath Iron Works Story” Trolley Tour will give you the inside story with a current or former employee of Bath Iron Works as guide on a trolley that rolls through Bath and past the BIW yard. Fascinating! Finally, if your focus is less lighthouses, more wildlife, the Maine Maritime Museum offers a Extraordinary Wildlife of Merrymeeting Bay Cruise. This incredible, three-hour cruise will introduce you to the unique ecosystem of Merrymeeting Bay. An area teaming with wildlife like bald eagles, osprey, Atlantic sturgeon, harbor seals, and more. Nature lovers will be in heaven. The Maine Maritime Museum is less than half an hour from Brewster House Bed & Breakfast in lovely Freeport, Maine. Brewster House Bed & Breakfast is the perfect base from which to explore the Maine coast and all it has to offer. Don’t settle for some stale, cookie-cutter hotel or motel when you can get better service and comfort for your money from a locally owned and operated Maine inn.